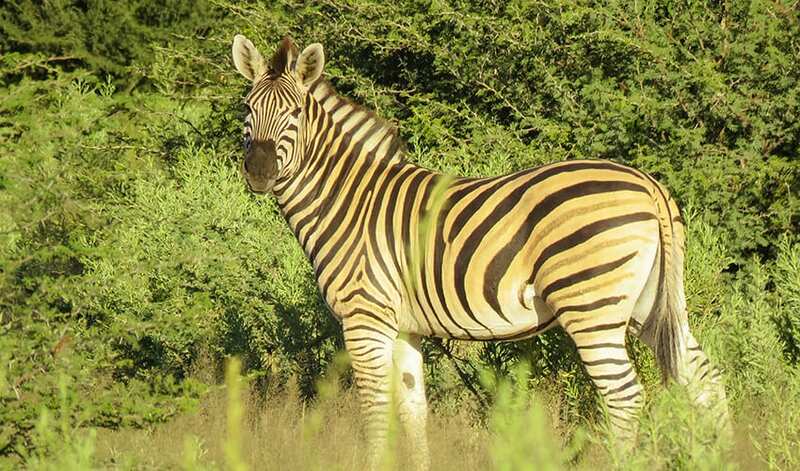 It doesn’t matter how many brochures/articles or blog posts you read about going on a safari, it really does not compare to actually experiencing one. 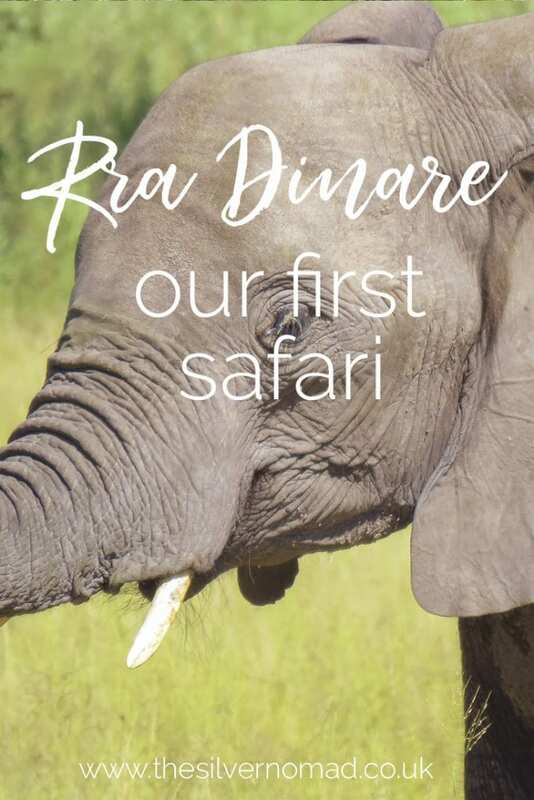 Rra Dinare in Botswana was our first taste of safari life and within minutes we were enchanted. We waved goodbye to Maun as we climbed into the tiny fixed-wing Cessna plane for our 20-minute flight over to the Rra Dinare. 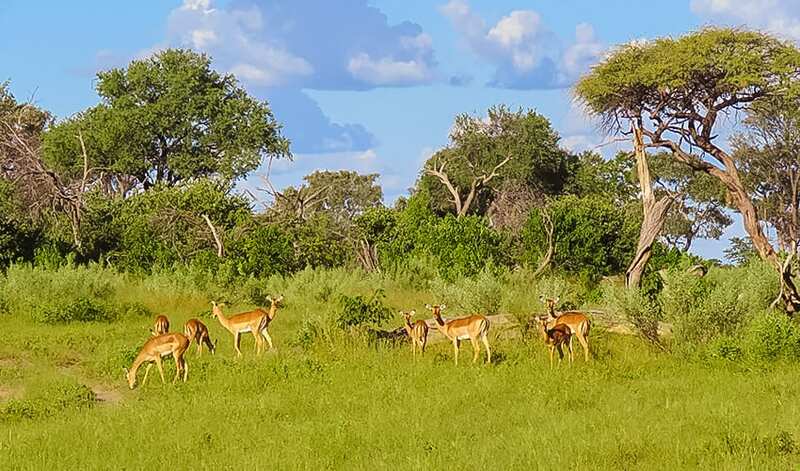 The campsite is in a private concession South East of the Okavango Delta next to the Moremi Game Reserve with a mixture of wetlands and drier grasslands. Landing smoothly on the grassy landing strip we saw a couple of jackals slopping off, before lying down to wait for us to disembark. Our guide, Moss and our spotter, Lake were waiting for us in the Land Cruiser. 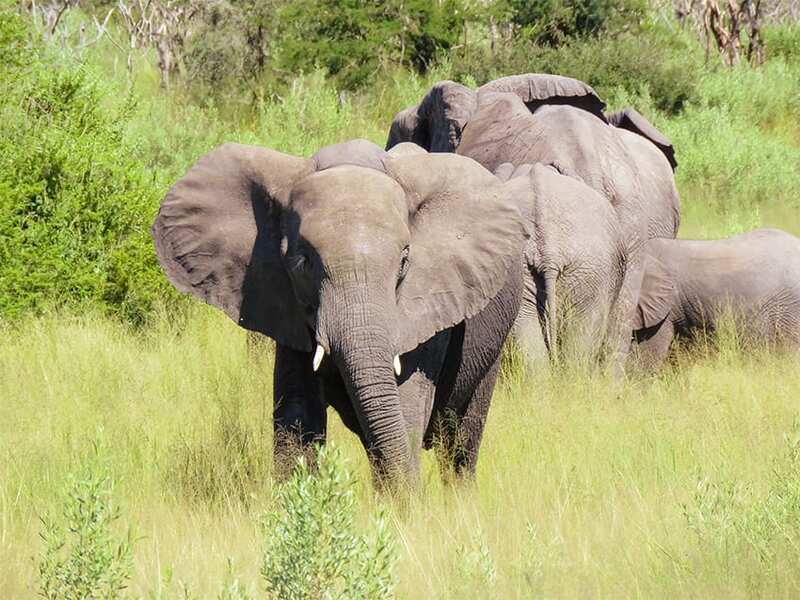 With introductions made and bags loaded, we drove off and within minutes I was well and truly gobsmacked as we came face to face with a herd of elephants. They surveyed us, found us pretty uninteresting and sauntered on their way, making sure the baby elephants were kept protected inside the group. We were transfixed. Our first real taste of wild animals and they seemed so unfazed about us being there. Amazing! Excited by our first encounter, we spent the rest of the short journey to the campsite eagerly scanning for other animals. 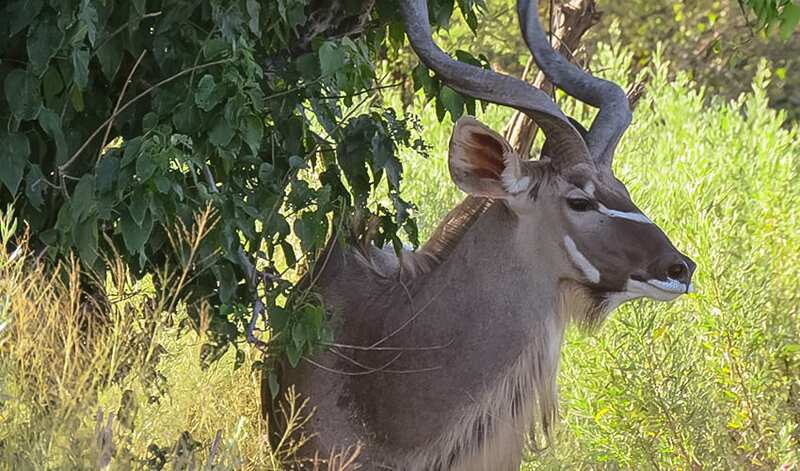 We managed to see spur-winged geese, distant zebra and impala – a lot of impalas, in fact, impalas everywhere! Our first proper safari set off at 2 pm. We shared a jeep with a couple, Nancy and Elliot from Vermont. We were greeted by the impalas just outside the camp who shook their little tails at us before gracefully skipping off. 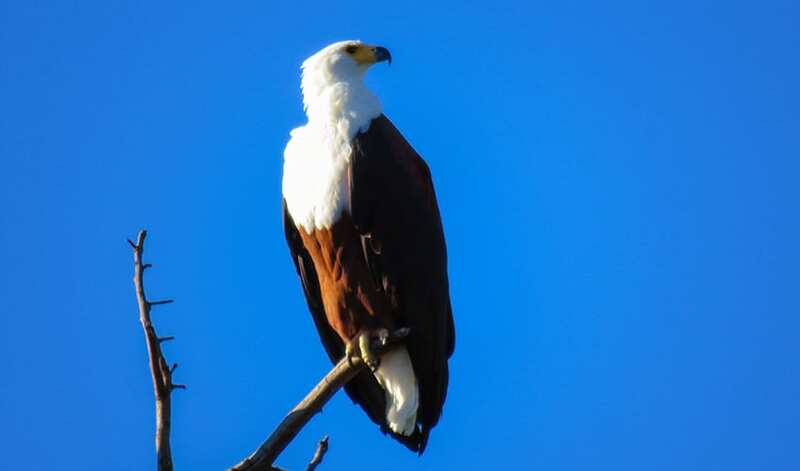 With our spotter, driver and the four of us in the back all looking for any wildlife, we quickly saw tsessebe, a beautiful African fish eagle, kudu, white-headed vulture, guinea fowl, more zebra, grey lory, jackals and of course impala. 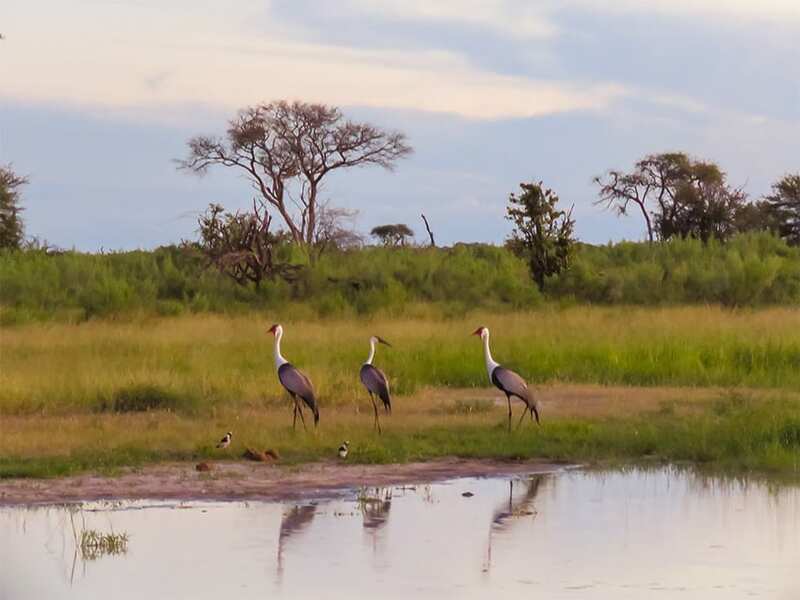 As the sun was setting, we stopped for a sundowner or two and watched elegant settle billed storks striding through the water. The sky darkening, we headed back to the camp for dinner and an early bed. Safaris generally mean an early start. 5.30am to be precise when they come by your tent and knock to wake you up. Coffee and breakfast are laid out for us and then it is time to go. Our Land Cruisers are ready to leave at around 6.00am to see the early morning animals. The light is amazing so early in the morning, everything is soft and gentle – the golden hour! Our bouncy impalas were not there to meet us this morning, but not far from the camp we came across a tower of giraffes (yes, “tower” is the collective name for a group of giraffes that are not travelling). The small group had a mother with several young of various ages. The radio crackled into life. There had been as sighting – lions! 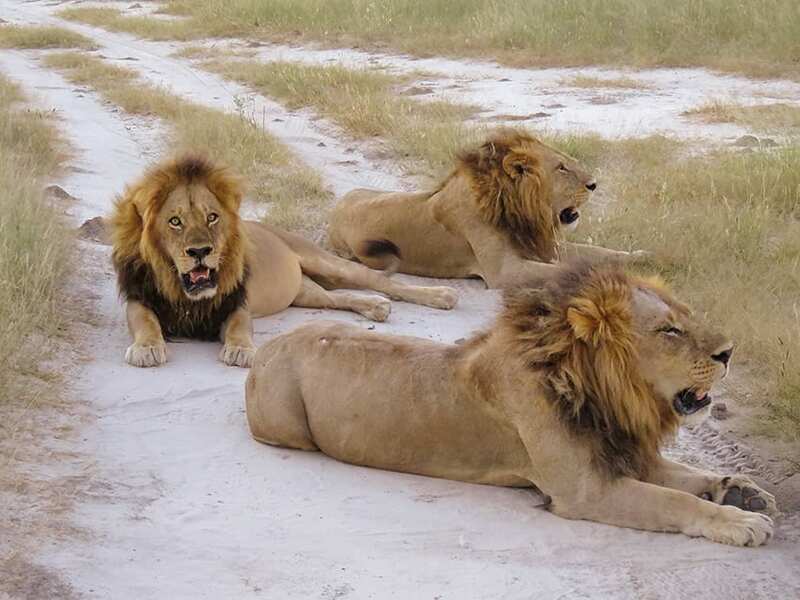 Three male lions had been spotted resting after a kill. We set off to find them, Lake and Moss scanning the ground for footprints. After 20 minutes of bouncing around off track, we slowed. There, lying in the shade in front of us, were the three males, their stomach bulging, too full to even acknowledge our arrival. The lions were so close to us. They occasionally opened their eyes just to check on us. Alan was convinced they were eyeing him up for their next meal. Moss explained that unless we stand up or get out of the Land Cruiser, the lions just see us as a big box and not the people in it. Though looking at the lions, I don’t think they were going anywhere fast! 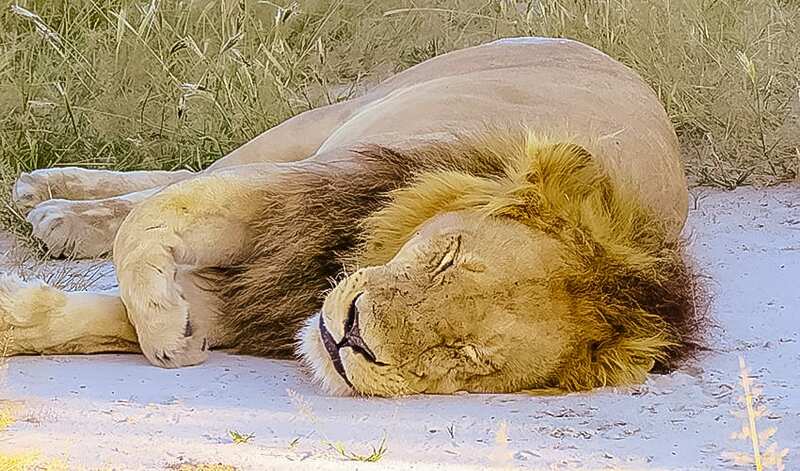 The lions looked so peaceful as if they wouldn’t hurt a soul. They occasionally sat up, yawned, looked around before flopping back over to snooze again. 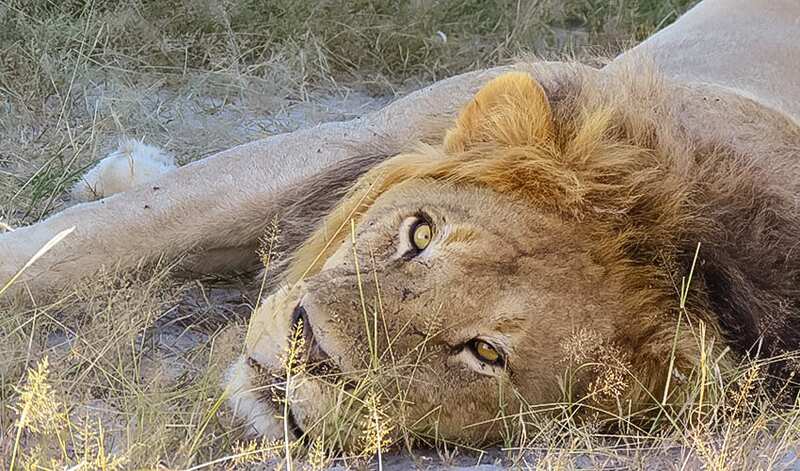 After about half an hour of watching and photographing the lazy lions, we moved on to our Mokoro ride along the Gomoti River. The original mokoros were dugout canoes that were used to travel the rivers fishing and hunting. Nowadays they tend to be fibreglass canoes to limit the cutting down of trees. The mokoros are still styled on the traditional dugout canoe with a flat bottom and poles (ngashas) are used to skim silently down the river. 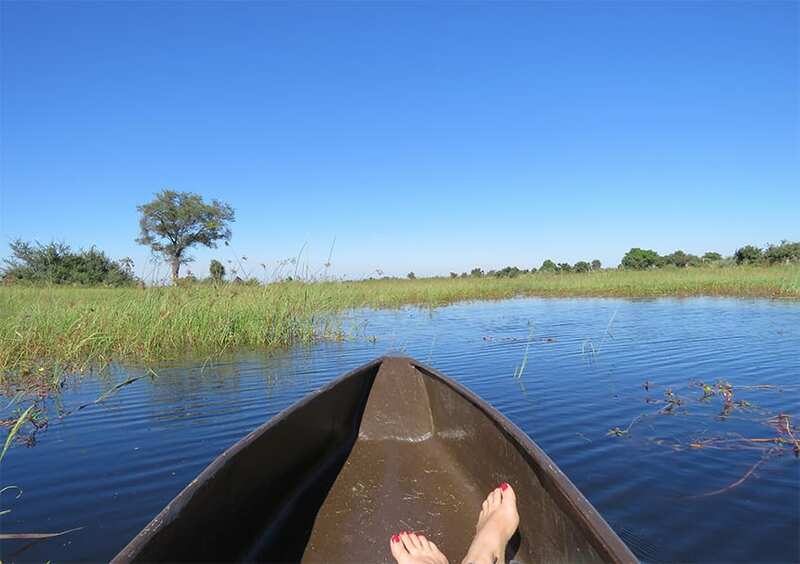 We quietly punted downstream where we could just see the top of the head of a hippo. We didn’t get too close so as not to disturb it and potentially have it chase us. We backed up and turned around to paddle upstream to give the hippo some space. On our way, the black-headed lapwing was pointed out to us. They lay their eggs on nests on the ground and this little bird becomes quite aggressive if you go near them. To trick jackals away from the nest, they pretend to have a broken wing and then fly away when they get too close to them. 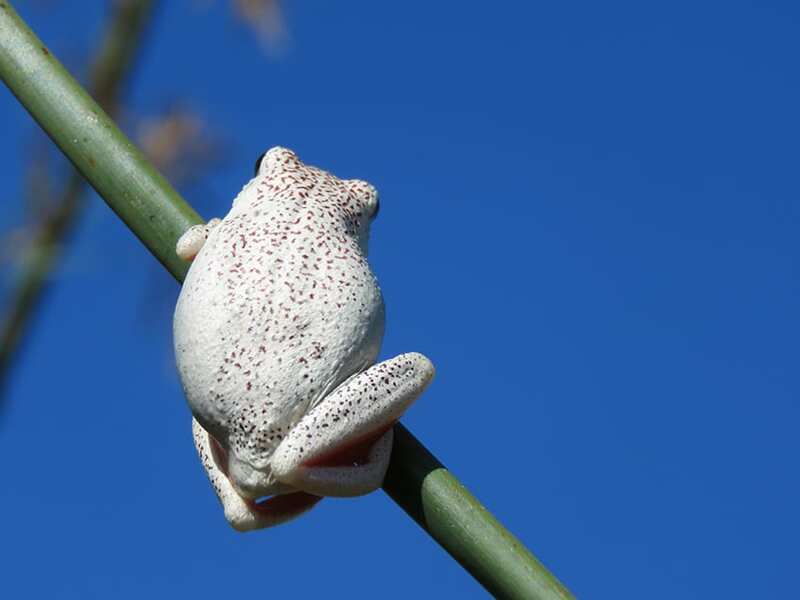 Looking very closely at the reeds themselves we found tiny 2cm reed frogs clinging on. They were quite difficult to spot as the reeds swayed gently in the breeze, but once we got our eye in we could see white spotted, red spotted ones and even green ones which seemed to merge with the reeds. After our cruise, we were taken back to the camp for a buffet brunch and a siesta before our second safari of the day. 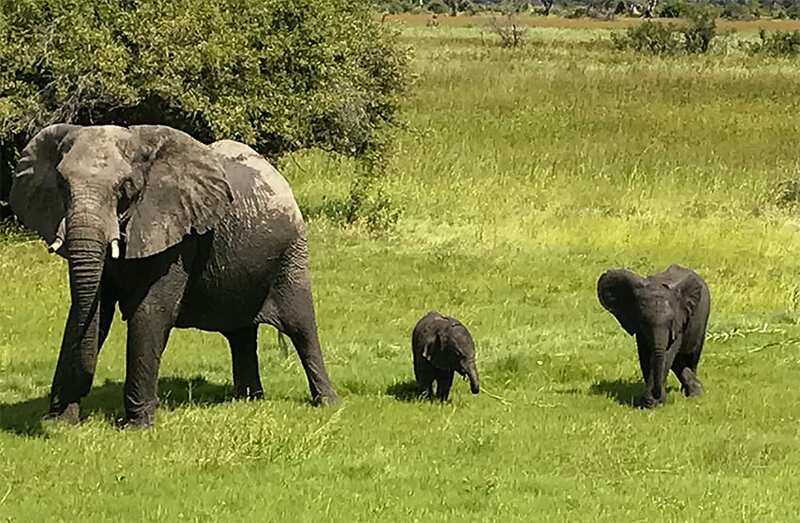 While we were lazing by the pool, a family of elephants wandered past in the distance, but about 20 minutes later our peace was interrupted by them coming back to the trail which led right through the camp. We watched quietly as the mother and father ushered their calves of differing ages through, making sure that they were protected. Refreshed from our siesta and some afternoon tea, it was time for our second safari of the day. Taking a different route out of the camp, we went to look for another of the Big Five, the water buffalo. And boy did we find them! We came around the corner about 10 minutes into the journey and slowed to a halt as we took in the landscape and the herd of water buffalo in front of us. Their muddied faces looked back at us. Slowly they moved to surround the young calves, guarding them against any possible threat. 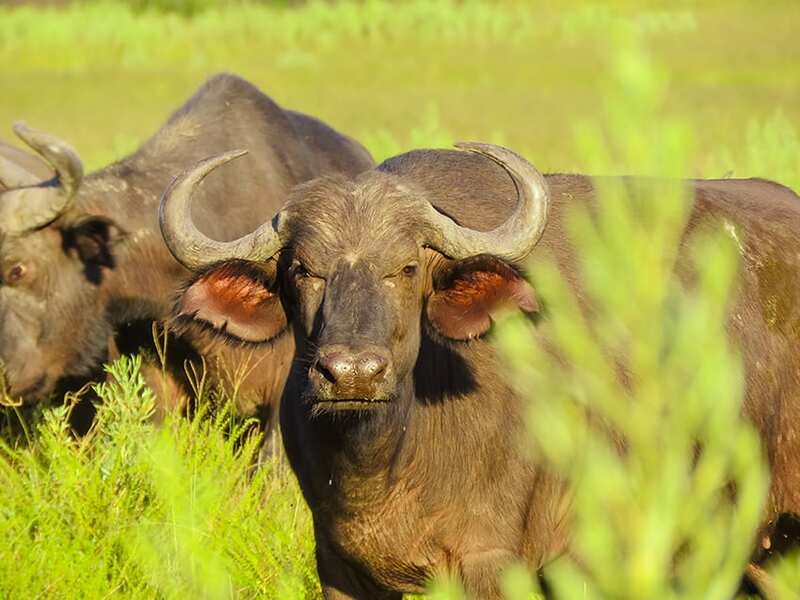 Water buffalo are quite intimidating with their horns and a slightly angry look to their face so we skirted around them, gave them a wide berth, and carried on our way. Two more of the 5s were next. First, from the Ugly 5, we saw Wildebeest (or Gnus), I got quite confused as they are basically the same animal, but Moss would talk about wildebeest then gnus, and I was sure he was pointing at the same animal, which it turned out he was. 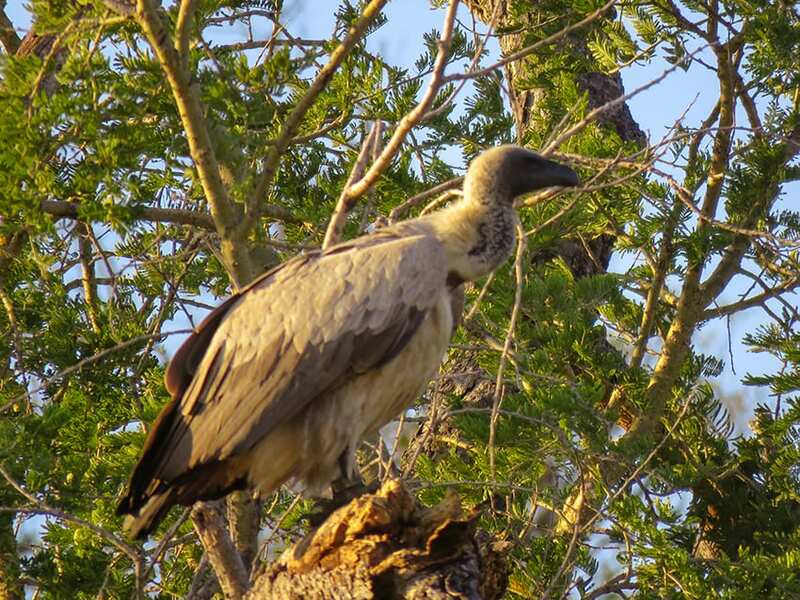 The next of the Ugly 5 were the vultures. I am sorry, but I kind of like these little guys, as they were youngsters and still had their fuzzy heads, though their wings were showing their adults feathers. With the scent of wild sage around us, we drove on, passing a female kudu and some distant dwarf mongooses (or is it mongeese??? ), giraffe and zebra. Then suddenly Moss stopped the vehicle and asked us to get out. We thought it was for an early sundowner, but no, we had a flat tyre! Moss and Lake would fit in at a Formula One track, they removed and replaced the tyre in a matter of seconds, okay I exaggerate about a minute, but they were really speedy. You don’t want to hang around outside the vehicles too long, you never know what is lurking. 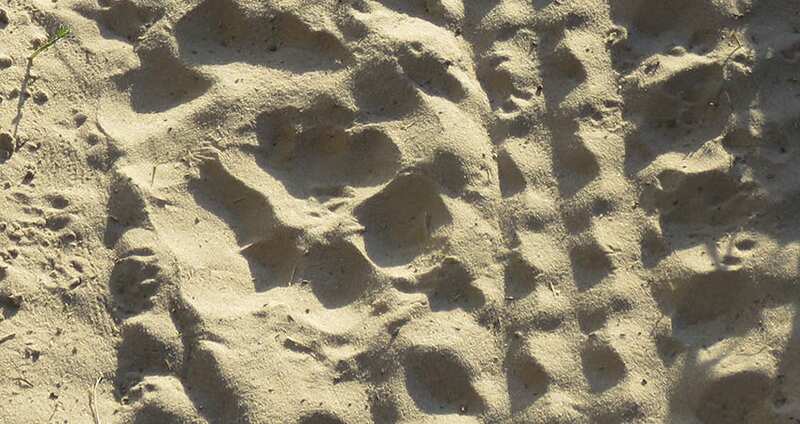 With the spare tyre on the Land Cruiser, we set out to see if the lions from the morning were still about. It took a few wrong turns, but just as we were about to give up, we found them, still full from the morning. 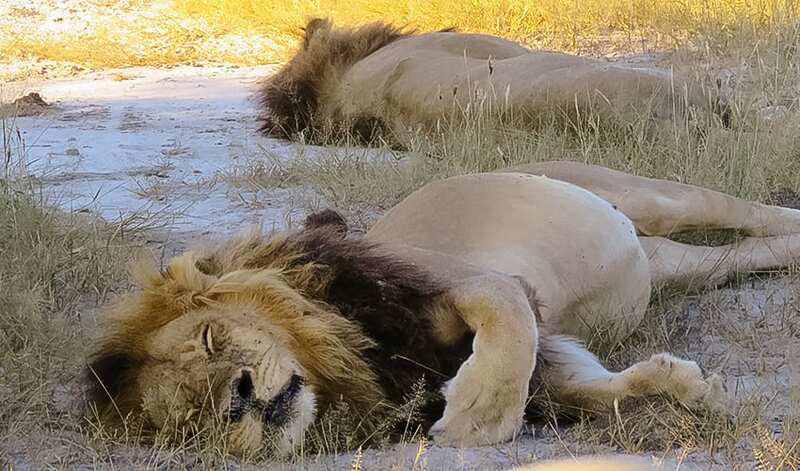 The lions were slightly more animated and all sitting up and panting in the late afternoon heat. We had the opportunity have a really good look at them and stare into their mesmerising yellow-green eyes. 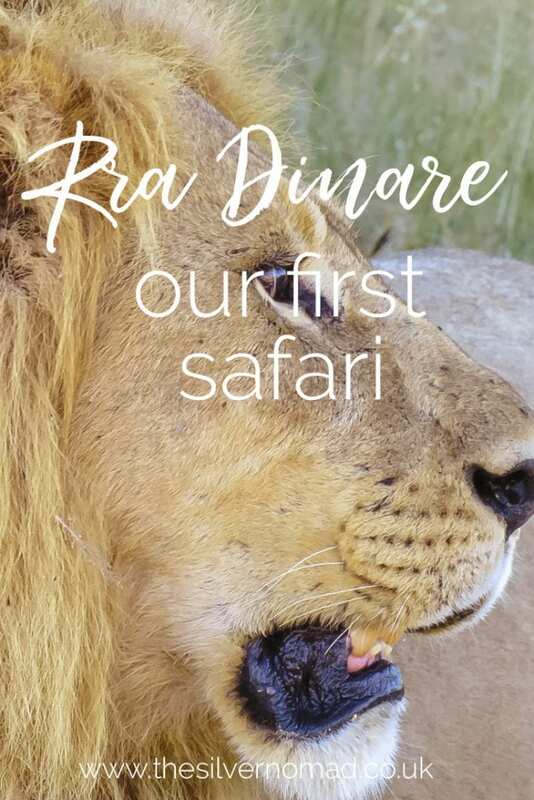 We spent so long watching the lions, that we missed out on our sundowners and went straight back to Rra Dinare and after a quick freshen up, it was time for dinner and then back to our tent to pack. 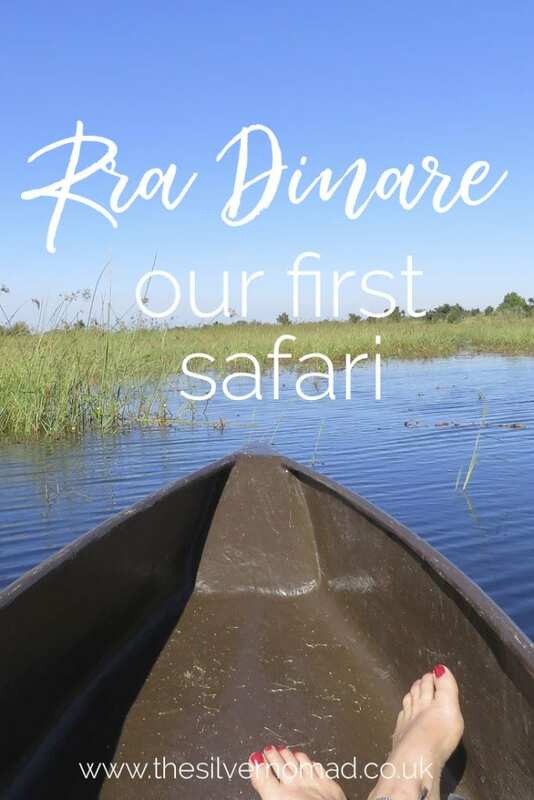 We started a little later this morning as Andy, the manager of Rra Dinare, took us over Mma Dinare, the new campsite from Under One Botswana Sky. Mma Dinare was still under construction when we were there, but it has now fully opened, with 9 luxury tents, all overlooking the Gomoti River. The scenery and peacefulness was breathtaking. The basic layout is the same as Rra Dinare with a bar, seating area and dining room as well as a fire pit to sit by at night and watch the stars. It would be interesting to go back and see Mma Dinare now that it is opened. 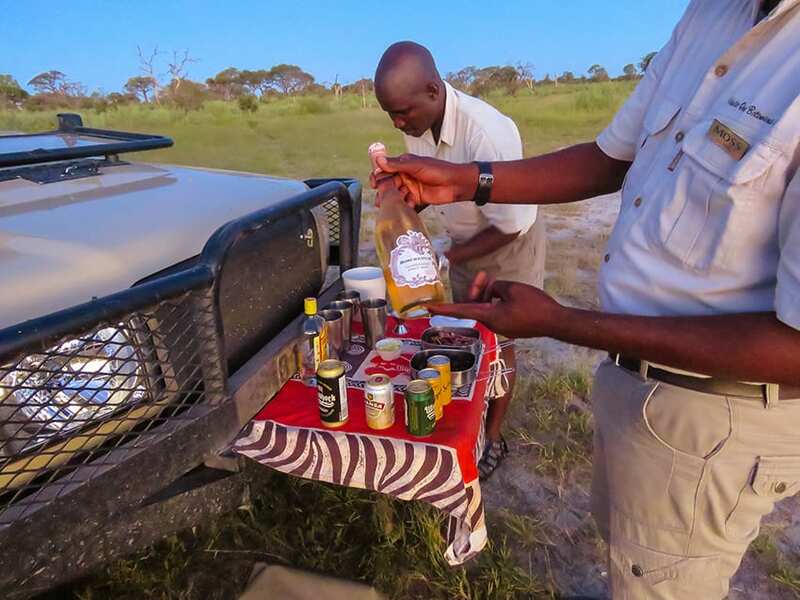 On our way to the back to the airstrip and flight to Kwando Lebala, our next campsite, we watched baboons playing in the trees, a family of giraffe striding across the plains and zebra nimbly moving out of our way. The small Cesna C208b touched down and we said our goodbyes to Andy and climbed aboard for our 40 mins flight north to Kwando Lebala and another 2 days of safari.